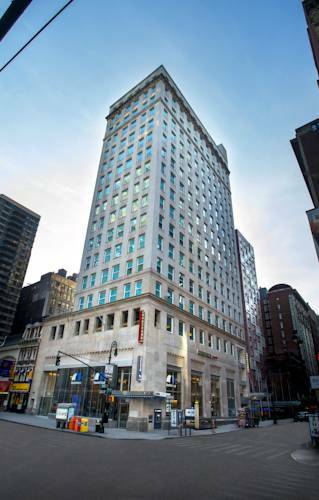 Stay in the heart of The City That Never Sleeps with Courtyard New York Manhattan/Herald Square. Take in sweeping views from our stylish accommodations featuring large workspaces, comfortable beds and ample space for you and your guests. Amenities like free high-speed Wi-Fi and premium cable channels on flat-screen TVs help you feel more at home. Each morning in our hotel is easier with Table 71, featuring healthy breakfast options and signature Starbucks drinks. In the evening, grab a beverage and meet with friends at Monarch, our rooftop and indoor lounge. Stick with your health goals with the help of our on-site fitness center, featuring a variety of cardio equipment and free weights. Be sure to visit locales within walking distance of our hotel like the Empire State Building and Macy's flagship store. Other popular attractions include Times Square, Madison Square Garden and the Garment District. Immerse yourself in the style of the city with Courtyard New York Manhattan/Herald Square. Visit our Herald Square hotel restaurant for refreshing breakfast choices. Table 71 Herald Square also offers specialty beverages made with Starbucks coffee to give you a jump on the day. Located on the 18th floor penthouse of the Herald Square Hotel, Monarch offers great music, delicious food, table service that won t blow your paycheck, and the friendliest door for miles.